When lawmakers convene next week for a second special session of the North Carolina General Assembly focused on Hurricane Florence disaster relief, they will be facing daunting challenges and hard choices. Unmet recovery needs involve thousands of damaged or destroyed homes and businesses, destroyed crops, killed livestock, and contaminated water supplies. Over 430,000 children live in the affected counties; 130 schools and as many as 200 child care centers remain closed due to storm damage. With storm survivors and many other voters in North Carolina watching, Gov. Roy Cooper is expected to put forward his plan for recovery this week. The question is whether the state’s key decision makers will rise above partisan bickering to adopt an adequately funded long-term response to the storm. A coalition comprised of state and local advocates concerned about the health and well-being of Eastern North Carolina’s children and families has come together as the Just Florence Recovery. We are speaking out to ensure sufficient storm recovery spending is appropriated to get people into safe, decent housing, and to protect the region’s health and environment. Hurricane Florence ranks among the top 10 costliest U.S. storms, with preliminary damage estimates ranging from $17 to $22 billion. The recovery response is staggering in its scope. It is already apparent that the needs of our communities will be much greater than available federal and state resources. Extraordinary state investment is required if this region is to recover from the short and long-term devastation. The Just Florence Recovery coalition is urging Gov. Cooper to request that the General Assembly unlock the record $2 billion in the state’s Rainy Day Fund, and authorize extensive use of these monies for emergency disaster relief. Without that step, caps on spending already imposed by the legislature will cut recovery efforts far too short. With more complete damage assessments involving flood impacted homes soon to become available, this damage will represent an extraordinary economic loss. Perhaps less than 13 percent of homes in the affected counties were covered by flood insurance. Moreover, many people in uninsured, damaged homes will either not qualify for federal housing assistance or not have the resources to take advantage of federal housing assistance. As guidance for lawmakers, the Florence coalition is pointing to the Hurricane Floyd Recovery Act of 1999, which addressed damages after another catastrophic 500-year storm, and authorized a spending package of over $830 million to help finance unmet recovery needs. The 1999 legislation included comprehensive housing assistance provisions. These included a range of direct assistance programs for homeowners and renters, as well as funding for community-based housing counselors to help in finding short and long-term solutions for families. 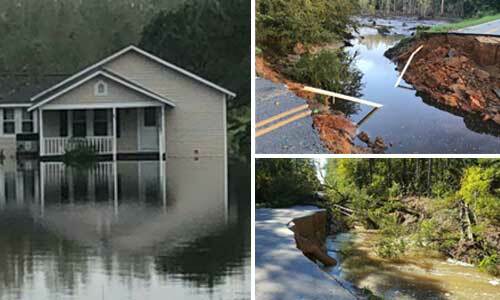 Eastern North Carolina’s environment took a major hit from the hurricane. To fortify the region’s resiliency and better prepare for future disasters, the Florence coalition is seeking state funding to ensure the clean up and removal of high risk operations located in the region’s 100-year flood plain. We are also advocating for the testing of drinking water wells to make sure water is safe to drink. The Just Florence Recovery coalition believes that displaced residents in Eastern North Carolina are worthy of a robust state investment. We sincerely hope that the state’s lawmakers will agree. Susan Perry Cole is President and CEO of the NC Association of Community Development Corporations (NCACDC), which is a member of the Just Florence Recovery network. This post appeared originally on the “For Children’s Sake” blog of the advocacy group NC Child.